Give your home an instantly cozy and welcoming look with the Alexa Sofa. 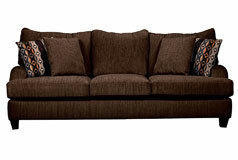 Covered in velvety, soft, choclate chenille, this wonderful upholstery piece is sure to make family time comfortable. Low-cut curved arms and plush, pillow-back design means this piece will flawlessly match any room décor, modern or traditional. 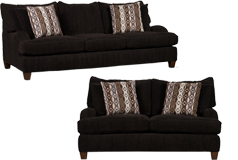 The look is completed by contrasting accent cushions and merlot-finished feet. 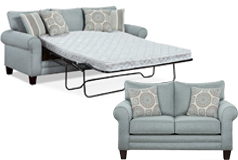 Dimensions: Sofa 96" x 42.5" x 38"